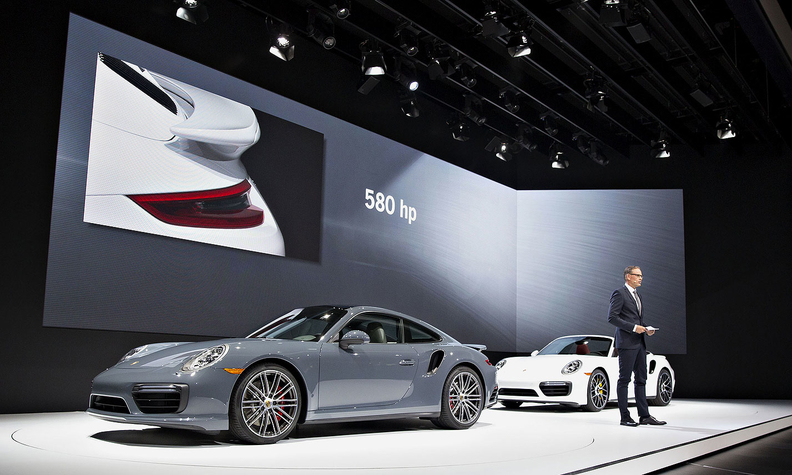 Porsche CE Oliver Blume introduces the 911 Turbo, left, and the 911 Turbo S at the Detroit auto show in January. FRANKFURT (Reuters) -- Volkswagen Group's sports car unit Porsche will skip the Detroit auto show next year. Porsche plans to focus on trade shows in New York and its most important U.S. market for sports cars, Los Angeles, a Porsche spokesman said on Tuesday. German trade magazine Auto motor und sport reported earlier on Tuesday that Porsche viewed the cost and value of participating in the Detroit show were no longer viable.